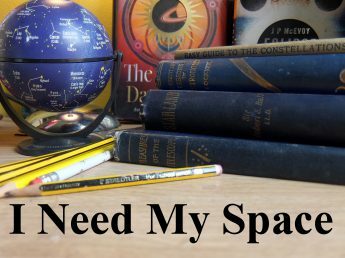 May | 2018 | I Need my Space! Had a good astro-evening last night. Visited Perton Library Astronomy group, then headed out to Boscabel House ‘observing site’ (such as it is!) and got a shot of the Moon and Venus, which I’m pleased with. 1600 ASA, 1sec, f2.8. Through the Heritage 100p, with my 9mm eyepiece, I was very pleased with the views of Jupiter too. The cloud bands were easily seen, and once again I was surprised by the capabilities of this £99 telescope. This next picture, however, was taken on the 9th May, with the 8″ mirror on the Skywatcher. And lastly, the crescent Moon through the 100p. I’ve got more to write up later when I’ve got time, about M51, the Whirlpool Galaxy in Canes Venatici…. Had a nice hour over by Boscabel House with the Opticrom 10x50s. With Jupiter in Libra, I did a tour of Libra, Serpens and Ophiuchus. I found M5 easily, a very bright globular cluster. Far less easy to find were M10 and M12 in Ophiuchus. Very, very faint indeed, and I wouldn’t have seen them had I not known where to look. I’d certainly not have found them by chance, whilst scanning the sky. Special mention goes to the fantastically named, very, very red star, Yed Prior, which means ‘the hand’, according to Wikki. Galaxies M81 & M82 found easily, as were globular clusters M13 and M92. Loving the Opticroms! Wolverhampton Astronomy Society met at Bobbington again last week, I’ll put up the observation report soon, but in the meantime here’s four pictures related to the session. It was a good ‘un! There were five scopes in use this evening. Two 200p Skywatcher reflectors on EQ mounts, a Skywatcher ED 80 reflector with go-to, a Skywatcher SkyMax-102 AZ Gti, and a Celestron AstroMaster 130. What a fine array of scopes! (Picture 1). Throughout the session we swapped views in different scopes, and found some scopes gave better aspects than others on different objects. And as is the case with astronomy, it’s not always ‘bigger is better’, (as I drove home later I thought back on how we’d found the faintest object through the smallest telescope!). Venus in the west and Jupiter in the south-east were easily visible as darkness fell. I’d brought my 8” Skywatcher rather than the society’s Tom Collier Dobsonian because I wanted to try and capture some images of Jupiter, and the Tom Collier won’t allow for the camera attachment. It was a moonless night, and after aligning our finder scopes and visiting the naked eye open clusters of Cancer (The Beehive) and Coma Berenices, (Melotte 111), it was suggested we looked for nebulae and galaxies. A couple of scopes turned towards Leo, which was perfectly placed, high in the south. We found the galaxies M65 and M66. These were quite a test for our instruments, being 9.3 and 8.4 magnitude respectively, and I made a quick sketch (Picture 2). They are both spiral galaxies, and M65 in particular displays the familiar elongated shape. I found that even through the eight-inch mirror, it was sometimes tricky to see both without using averted vision and ‘relaxed eye’ techniques. Undeterred by the not quite dark sky, we headed ‘next door’ to Virgo and the area of the sky poetically referred to as the ‘Realm of the Galaxies’. With the help of the SkyMax’s go-to mount, this small but powerful Maksutov-Cassegrain scope found two elliptical galaxies, M84 and M86. With magnitudes of 9.7 and 9.3, these would be the faintest objects we’d see this evening. Again, they were a real test for our eyes. The May sky never gets truly dark before midnight, so to find 9.7 mag galaxies was quite an achievement for the Skymax. We’re looking forward to seeing how it performs under inky-black winter skies. The galaxy hunt was far from over. The ED 80 was looking at the Sombrero Galaxy in Virgo, an edge-on spiral galaxy some 37 million light-years away. Using averted vision, we could see the elongated shape and brighter nucleus. Its Messier number is M104. Easier galactic targets were M81 and M82, in Ursa Major, right overhead. M81 – called Bodes Galaxy – being the brighter of the two. The Celestron AstroMaster (a recent purchase by one of our members), was doing some good planetary work. Jupiter was rising, and through the AstroMaster we were rewarded with some splendid views of all four Galilean moons, in an almost straight line. The disc was beginning to show cloud bands as the planet rose. The summer constellations of Cygnus and Lyra were rising above the trees in the east, and the Skywatcher reflector found the intriguing ring nebula, looking like a bright, gaseous planet. It seemed much brighter than the 9.3 magnitude given in my Cambridge Deep Sky Atlas. We also looked at the Great Cluster in Hercules, (M13), and its smaller brother, M92 was also added to the observation list this evening. The great cluster showed mottling in the even in the smallest telescopes, and the 8 inch mirrors revealed stars on the outer edge. Perseus is quite low now, and situated over the sky glow of Wolverhampton. Because of this, the double cluster was a little underwhelming. Yet it was only a few months ago were given a stunning view of it through the Tom Collier 10″ Dobsonian at our other observation site in Trysull. The double double in Lyra was split successfully by the SkyMax, and the Celestron AstroMaster took in a fine view of Zubenelgenubi, an optical double in Libra, to the right of Jupiter, just above it. (Picture 3). With Lyra climbing higher, we took the opportunity to view Albireo, the famous double star at the head of the ‘Swan’. The colours were obvious. The bright gold star contrasting with the smaller blue companion. I’d waited a few hours before I took some film of Jupiter, (I was waiting for it to get as high as possible), and I was pleased with the result. I put around a minute and twenty seconds of footage through various free astronomy programs to get the final image (picture 4). We started packing up around midnight, and everyone agreed it had been a productive session again. We’d seen many galaxies, double stars, open and globular clusters and a couple of planets. Perhaps next time we visit Bobbington we’ll be able to see Saturn, which is rising about 2:00 am now. That’s one of the great things about the night sky, it’s constantly changing, and there’s always something new to see. Once again, thank you to everyone that turned up, and thanks to those that put a couple of quid in the top hat again, to help show our appreciation to Rebecca and the owners of the campsite who are kind enough to let us use their land and amenities. A run of blue skies at last! We’ve had a smashing run of blue skies. Last night in Shropshire I enjoyed a beautiful dark sky, and the Heritage 100p and 10X50 Opticron binocular combination proved a winner. The 100p performed admirably. Venus’ disc, and later Jupiter and three moons. I’m still unsure of which galaxy I’m seeing in Leo though, I’m pretty sure it’s M65, I’m hoping to go out again later to sketch the area. The Beehive and Coma Cluster, the Perseus Double Cluster, all good stuff. Very nice to see was M51 in bins – the Whirlpool Galaxy. It’s a testament to the dark skies of Shropshire, that I was able to see several galaxies with these new bins. And now I’ve finally worked out how to align the red-dot finder on the 100p, I’m finding stuff with the minimum of faff. M81 and M82 were found in no time, and the Hercules globular clusters were also seen, with M13 proving to be very bright, and quite detailed in the 100p. The 100p also showed the asterism of ‘the diamond ring’, which is basically, Polaris and the stars that form a line-of-sight circle effect. I split Castor at high power, and wished I’d found Andromeda, just to ramp up the galactic count. If it stays clear tonight, I think I’ll see how many I can find in the bins alone.